This is our first hunt of the year, and the 11th point in Anhui for the group. Li Wei and Ray was part of the hunting party for the first point in Anhui (33N 115E), exactly 2 years ago at the eve of Lunar New Year. We had great memory of the scene of thousands of people crowding the highway for the last minute shopping before the New Year. Again, Lunar New Year was only a week away. Like a number of previous hunts we did in Anhui, Xiao Yu and Ray took the first flight from Beijing to Hefei, and met by Xiao Li and Li Wei. Our destination of the day was Lixin county (near 33N 116E), such the hunting for this point 2 degrees east was a major detour. The day before our hunting trip, a snow storm dropped several inch of snow across Anhui and made the scenery much prettier than the typical gray and brown for this time of the year. The snow also made driving a bit more difficult. About half way to the confluence point, we stopped at road side restaurant had a firepot lunch. Even though the temperature was only slightly above freezing, we found sitting outside under the sun was much warmer than staying indoor without heat. This was one of the few times we did not have to specify cold beer to get properly chilled beer. We pretty much followed the GPS and reached Guo Pei Township and put us less than 1 km from the confluence point. The most logical road heading toward the confluence point was so muddy and slippery such we gave up the car after 200 meters. We started walking with 780 meters to go but it was also slow going with a rather messy mixture of melting snow and mud. We reached the confluence point around 2.50 pm – the first confluence point for Xiao Li. 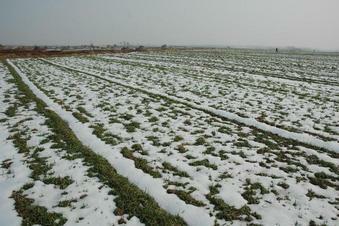 The confluence point located in a large field planted with winter wheat and partially covered by snow. On the way back toward the car we met a couple local farmers and had a nice chat. Turn out the confluence point located in Ming Quang city but only a couple hundred meters from the next county – Wu He (Five rivers). We also came across another two hunters carrying a very old style rifle and their objective was pheasants. After the hunt, we headed to Lixin. The first half of the drive was on secondary road, and occasionally we have to pass through towns filled with people busy preparing for the upcoming Lunar New Year. The second half of the drive was on an expressway that was closed earlier because of snow. We reached Lixin after dark. This was a straight forward hunt the snow and mud added some spice to the trip.